Do you need telemarketing services but don’t know where to start? If so, then you are in the right place.The Telemarketing Toolbox gives you a one-stop-shop to learn everything you need to know about a telemarketing campaign before you invest in one. Use the following steps to plan and implement your outbound calling or telemarketing campaign.. Step 1 - Access the Telemarketing Tools by completing the request form below. The tools include information in the form of white papers, a spreadsheet calculator and an online project worksheet. Step 2 - Download and read the free white papers. You will learn essential information you need to know, including: How to prepare for your outbound calling campaign, how to comply with the "Do Not Call" regulations and the new Telephone Consumer Protection Act (TCPA), what to expect to pay for outbound calling services, and the different types of outbound calling campaigns, including telemarketing and more. Learn what a "SAN" number is and how to get one. Step 3 - Use our "Online Project Worksheet" to plan your campaign and then print it for your own use - - and/or submit it for a free expert consultation. Don't worry, just fill out all that you can on the worksheet and our experts will contact you to help with the rest. We invite you to pick and choose which resources may best answer your questions. However, if you are new to telemarketing we recommend that you download and review all the resources found in our toolbox and have them handy when talking to an AnswerNet sales representative by calling 800-800-2418. 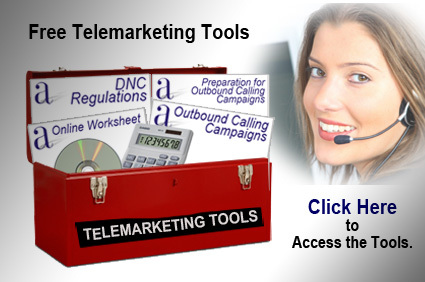 Note: Please feel free to link to this page or share copies of our Telemarketing Toolbox items with your friends as long as you do not modify them or remove our copyright notices. To get started, just complete the request form below to access the telemarketing tools and then contact us for a free consultation. Contact us today to for a consultation.